We warmly welcome new members who can swim a length (25m) of the pool and are keen to develop their technique. Swimmers must be past the Deep-end Level of Swimming Lessons. Trials for the club are held annually and we will notify you by email in advance of trials once completed application form has been submitted. Please ensure to register your interest as a waiting list is in operation. Trials = 1 length front-crawl, 1 length back-crawl, 1 length breaststroke, 2 minutes treading water. Please complete the application form here. On submission of your application, it will be reviewed by our coaches and when trials take place, you will be notified to attend and be assessed. Please ensure you check you email spam folder for a confirmation from us. Longford Swimming Club is also closely linked with preparing athletes for The Special Olympics and The World Games. We are an inclusive club and aim for members to reach their full potential. LSC is especially proud of the achievements of Patrick Flanagan and previous member Claire Kenny. 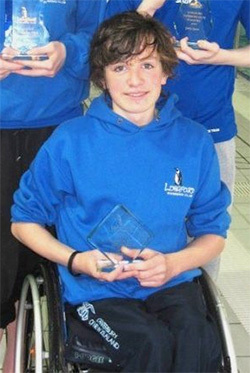 Patrick is currently having success in the National Para Swimming Squad. Swimming is a great fun activity and we hope that you will join us.